Mary Louise Pegues was born on 30 October 1881 in Marlboro County, South Carolina. Francis Preston Brooks Pegues and Jennie May Pegues appeared in the US federal census of 1 June 1900 in Smithville Township, Marlboro County, South Carolina, enumerated near to Frank's brother John.. Other members of the household included Mary Louise Pegues, Rufus Randolph Pegues, Preston Brooks Pegues, Marlborough Kenneth Pegues, Nancy Pegues, Jennie May Pegues and Harriet Elizabeth Godfrey Gillespie. Francis Preston Brooks Pegues and Jennie May Pegues appeared in the US federal census of 15 April 1910 in Smithville Township, Marlboro County, South Carolina. Other members of the household included Mary Louise Pegues, Marlborough Kenneth Pegues, Jennie May Pegues and William Leak Pegues. She married Olin Marcellus Pegues, son of Rufus Marcellus Pegues and Sara Olivia Pegues, on 1 June 1910 in South Carolina, second cousins; their paternal grandfathers were brothers. The following appeared on 6 June 1910 in The State: (Cheraw, June 5) On Wednesday evening at 7:30 o'clock, the country home of Mr. and Mrs. F. P. B. Pegues, about 10 miles from Cheraw, was the scene of an unusually beautiful wedding, when their daughter, Miss Mary Louis Pegues and Olin M. Pegues were united in marriage. The ushers were: Randolph and Preston Pegues, brothers of the bride, and Hilliard and Darius Pegues, brothers of the groom. Preceding the bride down the front steps came the maid of honor, Miss Nancy Pegues, who wore a gown of white messaline and carried pink roses and ferns. The groom was attended by his brother, Elbert Pegues, as best man. The ceremony was performed by Rev. Mr. Rouse of the Methodist church. The bride wore an elegant draped gown of white crepe meteor, the yoke of which was caught with pearls, having a bertha of imported real lace, her tulle veil was caught with lilies of the valley, and she carried an armful of bride's roses and lillies of the valley. Immediately following the ceremony a brilliant reception was held. After the reception the bride and groom motored to Rockingham, N.C., where they boarded the Seaboard train for Northern points. The following appeared on 12 December 1912 in The Evening Chronicle: Mrs. Olin N, Pegues and daughter, Miss Mary Louise Pegues of Kollock, S. C., are spending a few days here [in Charlotte] with their kinswoman, Miss Nannie Pegues, who has been undergoing treatment at the Presbyterian Hospital for a year or more. The following appeared on 25 June 1916 in the Charlotte Sunday Observer: (Rockingham, June 24) Nancy Pegues, daughter of Mr. and Mrs. Frank Brooks Pegues, and Hugh Waddell May of Charleston, W. Va., were married at the country home of the bride Wednesday evening at 7:45. Rev. Mr. Harmon, pastor of the Methodist Church of Cheraw, S. C., officiated. The ceremony was performed on the lawn of the century-old home. The first of the bridal party to appear were the ushers, five brothers of the bride, Randolph, Preston, Marlborough, Victor and Olin Pegues and a cousin, W. C. Leak, Jr., following, came the two dames of honor, Mrs. Olin Pegues and Mrs. W. C. Leak, sister and aunt of the bride, and the maid of honor, Miss Jennie May Pegues. The bride came down the long piazza leaning on the arm of her father, and was met by the groom with his best man, James Woodrow. 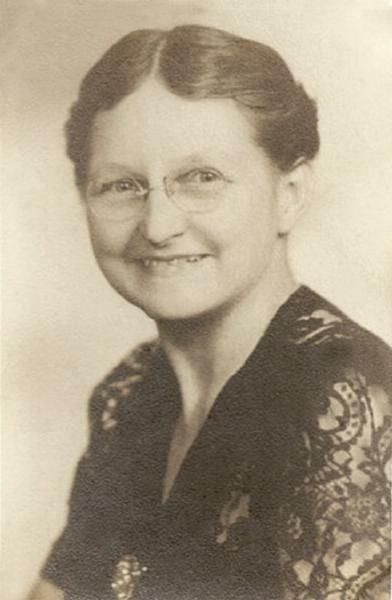 The wedding music was played by Mrs. Claude Ashton-Jones of Charleston W. Va., who also accompanied Miss Cora Stansill as she sang, "Until," by Wilfrid Sanderson. Olin Marcellus Pegues and Mary Louise Pegues appeared in the US federal census of 1 January 1920 in Smithville Township, Marlboro County, South Carolina. Other members of the household included Mary Louise Pegues, Hilliard Evans Pegues, James Wright Pegues, Joseph Calhoun Irby, Preston Brooks Pegues, Marlborough Kenneth Pegues, Victor Rene Pegues, Jennie May Pegues and William Leak Pegues. Mary Louise Pegues became a widow at the 31 July 1929 death of her husband Olin Marcellus Pegues. The following appeared on 1 August 1929 in The Charlotte Observer: (Bennettsville, S.C., July 31) Olin M. Pegues, prominent citizen, died at his country home in upper Marlboro county today after an illness of several months. He was five times elected to the legislature from this county, and there gave honest and disinterested service of high type, frequently to the sacrifice of his health and personal welfare. He inherited and emulated the high tradition that public service, faithfully and unostentatiously rendered, was an obligation running with the land and with his citizenship. His early landowning ancestor, captain Claudius Pegues, was the first provincial legislator resident of the Pee Dee before the revolutionary war, and the first house member from Marlboro county when it was formed immediately after the revolution. In all the years that have since passed, the Pegues family has clung to its original land holdings, and has made its steady and quiet contribution to the public welfare, at the old home of his ancestors. [A]t the old home of his ancestors Olin Pegues lived and died, winning solid reputation for his integrity, and the growing and lasting affection of many friends. Her was 56 years old, an early graduate of Clemson college, and one of the large planters of Marlboro county, the son of Major Rufus M. Pegues and his wife Sallie Olivia Pegues. Mr. Pegues is survived by his wife, Mary, the daughter of the late F. B. Pegues, and one daughter, Mary Louise Pegues. In the death of Olin M. Pegues the county and state have lost a useful and honorable citizen. Mary Louise Pegues appeared in the US federal census of 1 April 1930 in Pegues, Marlboro County, South Carolina. Other members of the household included Mary Louise Pegues and Hilliard Evans Pegues. Boarding in the household were two single female schoolteachers. Hilliard Pegues also is enumerated nearby as head of a household in which the Turnage family of five was lodging. She was a farmer, according to the 1930 census. She officially witnessed the death of Marlborough Kenneth Pegues on 22 April 1938. Victor Rene Pegues and Elisabeth Hamer appeared in the US federal census of 1 April 1940 in New Hope District, Marlboro County, South Carolina. Other members of the household included Mary Louise Pegues, Preston Brooks Pegues. In 1935 they all were living in the same house. Mary Louise Pegues died on 14 October 1965 at age 83 in Rockingham, Richmond County, North Carolina, at Richmond Memorial Hospital . Her death was officially witnessed by Mary Louise Pegues. She was interred at New Hope Methodist Church Cemetery, Wallace, Marlboro County, South Carolina. The following appeared on 15 October 1965 in The Florence Morning News: Mrs. Mary Pegues. (Rockingham, N. C.) Mrs. Mary Louise P. Pegues, 83, died Thursday at Richmond Memorial Hospital after a long illness. She was the widow of Olin Marcellus Pegues, a former member of the South Carolina House of Representatives from Marlboro County. Mrs. Pegues was born in Marlboro County, a daughter of the late Jennie May Pegues and Francis Preston Brooks Pegues. She attended Rockingham schools and was graduated from Winthrop College. Her husband died in 1929. Surviving are a daughter, Mrs. William Ed Harrison of Rockingham, with whom she lived since 1940; two sisters, Mrs. Paul F. Hammond of Bennettsville and Mrs. Hugh May of Charleston; a brother, W. Leak Pegues of La Marque, Tex; two grandchildren and three great-grandchildren. Funeral services will be conducted at 4:30 p.m. Friday in New Hope Methodist Church in Marlboro County by Rev. J. Clyde Quick. Burial will be in the churchyard.